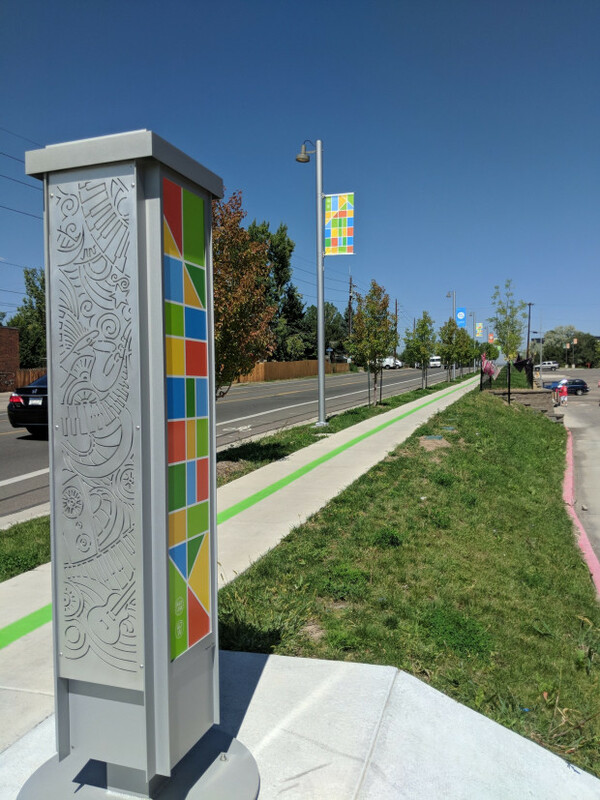 The 40 West ArtLine is a 4-mile walking and biking free outdoor gallery experience in the heart of the state-certified 40 West Arts Creative District near historic West Colfax Avenue and the W Line light rail in Lakewood, Colorado. Visitors can follow a green painted path on the ground and find over 70 permanent and temporary public art installations as they explore public spaces in a new way. 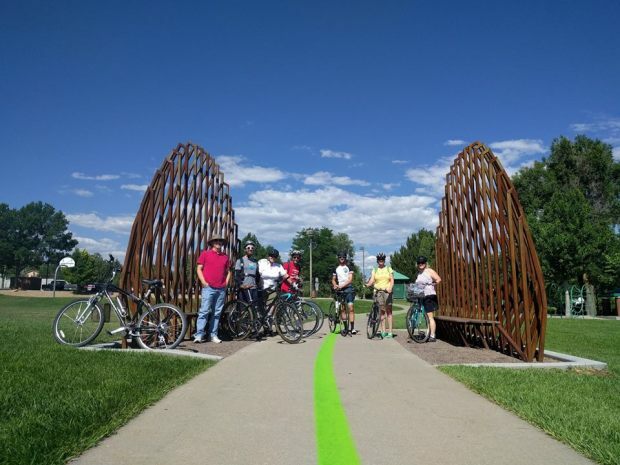 Supported by a $100,000 Our Town grant from the National Endowment for the Arts, the largest awarded in Colorado, the ArtLine launched in 2018 after years of planning. 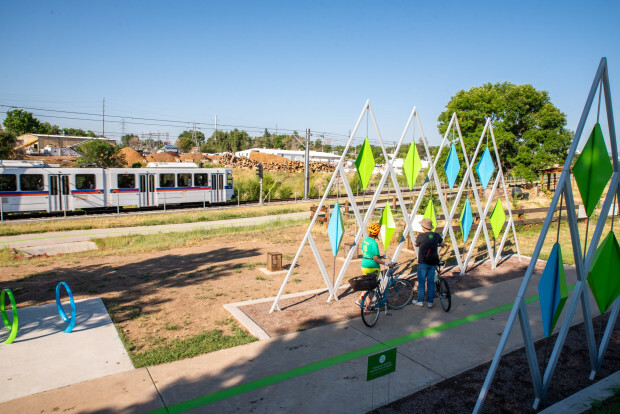 During a community planning effort for the 40 West Arts District in 2012, residents and stakeholders identified the ArtLine concept as a way to enhance and beautify the existing built environment through public art and creative placemaking and to connect three area parks with transit, historic neighborhoods, and local businesses. 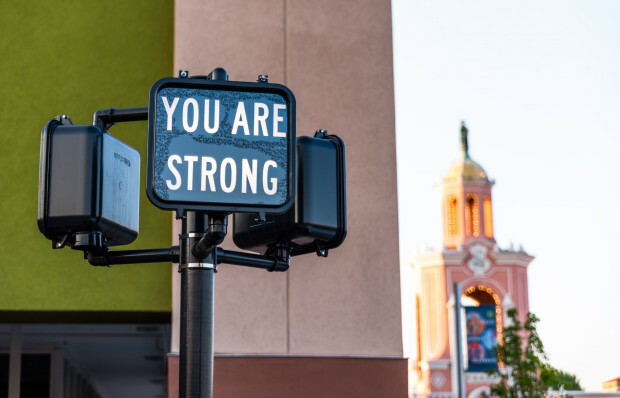 The Our Town grant allowed us to employ artists as problem solvers working collaboratively with the community to improve the livability of the area through art and creative placemaking and to move this vision forward. 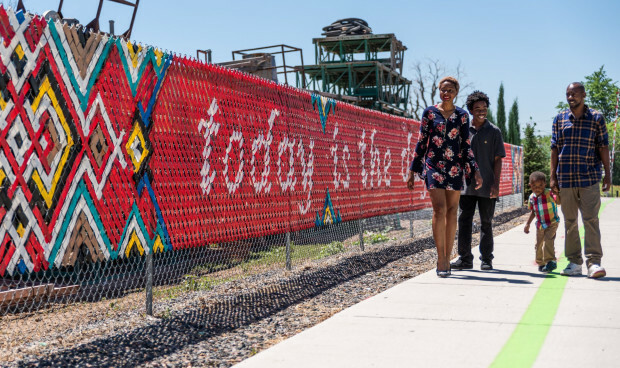 The extensive community input we received throughout the project indicated a desire for art that is interactive, colorful, engaging, and appealing to all ages and walks of life. Integrating site specific, commissioned art along the route in a thoughtful, curated way, with attention to aesthetic excellence and the interactive, playful experiences desired by the community, was a key project goal and is anticipated to enhance quality of life in people’s daily experiences. 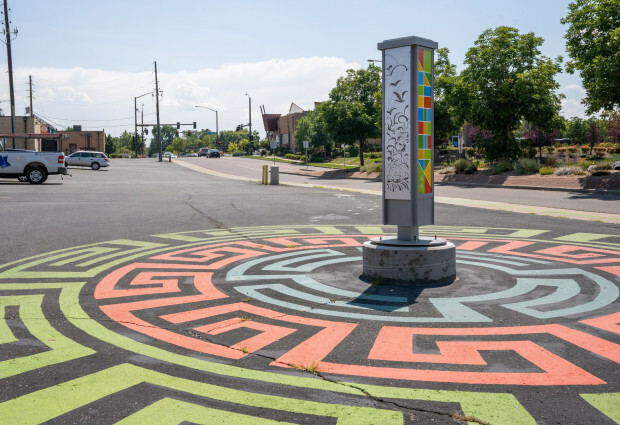 The City of Lakewood managed the project in collaboration with 40 West Arts and the Lakewood-West Colfax BID. The art and artists were selected by a volunteer art selection panel through a competitive call for art and invitational process. Nearly two dozen artists and galleries/art co-ops were hired to create and install ArtLine art, with community volunteers assisting with many installations. The artists, designers and fabricators whose work is represented include: PUNCH LLC, Timothy Flood, Maureen Hearty, Katy Casper, Anna Charney, Bobby Magee Lopez, Yulia Avgustinovich, Sandra Fettingis, Ladies Fancywork Society, Lauren Culbreth, Next Gallery, Pirate Gallery, Edge Gallery, Carlos Fresquez, Nestor Fedak, Michelle Wolins, Colorado Water Jet, DaVinci Signs, Will Strathmann, Rick Griffith/MATTER Graphic Design, and IDSculpture. Deana Miller with AMPA was the public art consultant for the project. The community was a key partner, and in addition to the art selection panel, included a 30 person steering committee and hundreds of community members who participated in project surveys, planning, and implementation throughout the two-year effort to plan for and launch the project. This collaborative project would not have been possible without the support of local, non-profit, regional, and federal dollars. We anticipate the 40 West ArtLine, which is envisioned to eventually become the longest continuous arts experience in Colorado, will serve a broad and diverse community of residents, students, business owners, employees and transit users in neighborhoods within and surrounding 40 West Arts District, and visitors interested in a unique recreational opportunity to experience art, parks and culture in a state-certified Creative District. For more information about the project, please visit www.40WestArtLine.org and follow us on Facebook.